Novels about the wives of famous men seem to have become very popular over the last few years. Books on Zelda Fitzgerald, Anne Morrow Lindbergh, Hadley Hemingway, Lizzie Burns (Engels) and Virginia Clemm Poe are just a few that I’ve read or heard about. You could be forgiven for thinking that with The Little Chronicle of Magdalena Bach, Esther Meynell is following the current trend – until I tell you that this book was published in 1925. Anna Magdalena Bach was, of course, the wife of the composer, Johann Sebastian. In this novel, Meynell imagines that, following Bach’s death, Magdalena is visited by Caspar Burgholt, a former pupil of her husband’s, who suggests that she write down everything she remembers about him. The Little Chronicle is the result. Magdalena begins by telling us about her first encounter with Bach in the winter of 1720, when she hears him playing the organ in St Katharine’s Church in Hamburg. Unaware of the organist’s identity, Magdalena is mesmerised by the beauty of his music, but runs away in a panic when he turns to look at her. Her father tells her later that the man whose playing she loved so much is Johann Sebastian Bach, the Duke of Cöthen’s Capellmeister (director of music). In 1721, more than a year after the death of Bach’s first wife, Barbara, he asks for Magdalena’s hand in marriage. Magdalena is overjoyed – and goes on to devote the rest of her life to caring for her husband and raising their children. And that is the problem with this book. Magdalena’s life (at least as it is portrayed by Meynell here) just isn’t very interesting. Of course, I’m aware that eighteenth century women weren’t usually expected to do anything more than be a wife and mother, and it’s possible that Magdalena was content with that, but I’m sorry to say that I found her story quite tedious to read. The real-life Magdalena apparently shared her husband’s passion for music – she was a talented singer and she also worked as a copyist, transcribing Bach’s music – but the fictional Magdalena constantly plays down her own achievements and gifts, happy in the knowledge that she could never compete with her husband’s genius. On reaching the end of the book, I didn’t feel that I’d really learned anything about Magdalena as a person; I had no idea how she really felt about anything, what she liked and disliked or what her hopes and dreams were. All I knew was that she loved and worshipped her husband, because she told us so over and over again. I did learn quite a lot about Bach himself (while remembering that, as is stated at the end of the book, some parts of the story are imaginary). Magdalena’s chronicle takes us through all of the key moments of Bach’s career and also spends some time discussing his music. I think, though, that the musical aspect of the book could be too detailed for readers who are more interested in the human side of the story, while not scholarly enough for those who already have a good knowledge of Bach’s music. And again, it seems that Bach didn’t have the most exciting or dramatic of personal lives, which makes me think that maybe he and Magdalena just aren’t good subjects for a work of fiction. It’s a shame, because there’s nothing wrong with Esther Meynell’s writing; it’s the story itself which lacks colour and vibrancy. I was pleased this was such a short novel because had it been much longer I’m not sure I could have persevered with it. I was disappointed but, if nothing else, reading this book has made me more interested in listening to Bach’s music, which can only be a good thing. I received a copy of this book via NetGalley for review. Interesting, but from your review not enough for me to want to read it. I knew that she was a good copyist and that more recent research suggests that not only was she more capable than she is given credit for but also that some of her own compositions are masquerading as his work because of the conventional prejudices of their times. Now a study of all this, that I’d like to read. 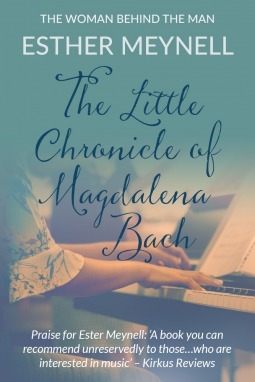 I knew nothing about Magdalena before I started to read this book, but I did some research while I was reading and came across the theory that she may have been responsible for some of Bach’s work. Whether it’s true or not, it would have made a much more interesting novel! In 2012 Australian musicologist Martin Jarvis posted a promo for a documentary based on his book which tries “to prove through forensic document examination that Anna Magdalena Bach was, in fact, the composer of the six cello suites and a number of other works attributed to her husband. Modern science techniques prove she was a composer and not a copyist, as previously thought.” I first heard this interesting theory on a BBC4 documentary broadcast in March of this year, though sadly this doesn’t seem to be available to view any longer. Thanks for that. It’s a shame the documentary isn’t available now. It’s too bad this book wasn’t better; it sounded like it could have been so interesting. Yes, it had the potential to be an interesting story but I felt that the author chose the wrong things to focus on. It could have been so much better. Hello Helen! I’m glad to see that you more or less agreed with my thoughts on this one. Baffling, wasn’t it? Strikes me as an odd choice for a reissue, but perhaps they thought the appeal of the name would override the fact that the writing is so very dated. I agree about the musical references. While I know a fair bit about certain aspects of Baroque music by now, I’m not familiar with Bach, and so I found all these references rather dry, because I had nothing to link them to in my mind. On the other hand, someone like my particular Bach-loving friend would probably find them insufficiently thorough. It’s a bit of a mire, doing something like this. Perhaps that’s why not very many composers have had novels written about them. Although, come to think of it, isn’t there another one about Bach and Frederick of Prussia? *Scurries over to Amazon* Yes, Evening in the Palace of Reason, that’s it. I might give that a go at some point, also because I’d quite like to learn more about Frederick too. Have you read that one? After reading your review last week I wasn’t expecting too much from this book, but I was still disappointed. I would like to read Evening in the Palace of Reason, though. I hadn’t heard of it until you mentioned it here but it sounds fascinating. I know even less about Frederick than I do about Bach and I would love to learn more! happy in the knowledge that she could never compete with her husband’s genius? Ugh. I too am curious as to why this book would be re-released. She’s certainly not an easy character for modern readers to identify with! I am sorry to read about your disappointment with the book. You wrote: “I didn’t feel that I’d really learned anything about Magdalena as a person; I had no idea how she really felt about anything, what she liked and disliked or what her hopes and dreams were”. You are right. But why did you have such expectations? I think there is no information about Anna Magdalena’s life and personality. Of course, author of the book could have invented some story, maybe even a shocking story. But it was, luckily for me, written in 1925, and at that time there was no such need. I enjoyed this book. It is based on facts we know, facts from J.S. Bach’s life, life of a great person. I agree , Anna Magdalena is portrayed as a person admiring her husband, obedient, submissive – it may raise some doubts, maybe even protest. What I like about this book is total harmony – in thoughts, in actions, in marriage, in family. Maybe it is a total fiction, but it matches the harmony of J.S. Bach music.